A month ago I notice a sign on the front door of my city building ( no firearms or weapons allowed)! I wrote about this in a previous blog post. Something that wasn't there when I went to vote in 2012. About 2 and a half weeks ago I attended a city council meeting for another reason and asked when the sign had been put up? Who (specifically) voted on it and was it done in a closed or open meeting? You may note that it does not address my questions at all. 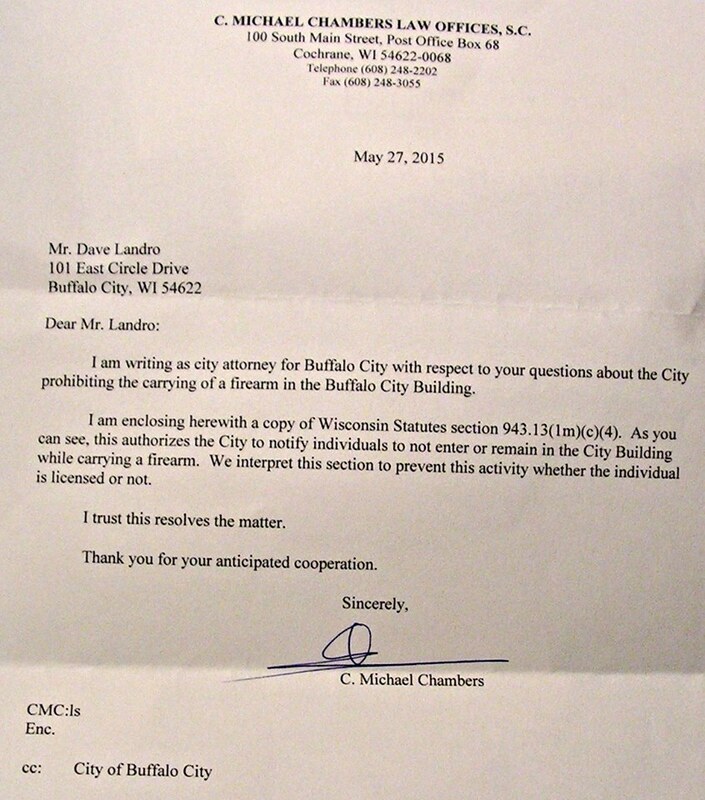 Thank you for your reply on behalf of the Buffalo City Council and Mayor. I must say that I am well versed in Wisconsin law concerning open and concealed carry. I've been doing so for many years. I know the city may put up a sign. However the questions I asked were not about whether or not they had the right as representatives of the populace of Buffalo City, The questions I specifically spelled out to them were (and the council is well aware of this): When was it voted on and by whom? Specifically whom? Was it an open meeting or was this done behind closed doors? Was it one member who took it upon himself to put up the sign or was it voted on by the council and passed by a vote? Was the public given an opportunity to comment? I asked for this information at the last council meeting, where I was told; there would be no further discussion on the topic and my time was up. I did not get an answer but was told you would provide them for me. As this has not happened, I feel that either the council did not make my request clear to you, considering your answer, or I am being stonewalled. Either way, I am not very pleased. My next course of action; if I do not get my answers, will be to discuss this with counsel. I will not be easily dissuaded from this course. The answers I am seeking are public record and I find it strange that the council, or one member of the council found it necessary to engage your services rather than just hand over the information I asked for. Please, either send me the specific information I requested or the legal, valid, constitutional reason for not providing them to me. I would prefer not to take this any further than a simple question... However, I will pursue this till I get my answers. P.S. 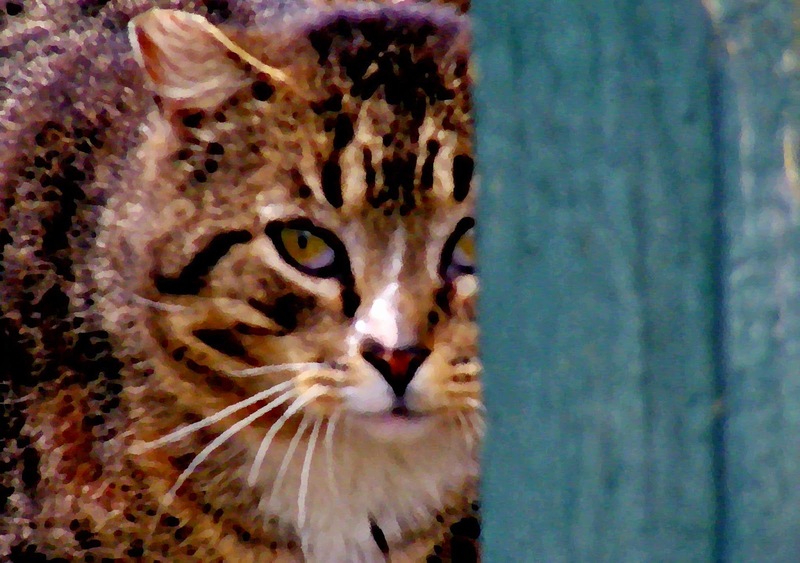 I would like the Monday, May 11th 2015 meeting minutes provided to me at your and the council's earliest convenience. 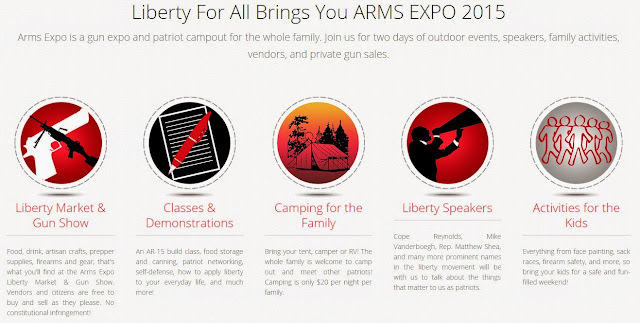 Arms Expo is a gun expo and patriot camp-out for the whole family. Join us for two days of outdoor events, speakers, family activities, vendors, and private gun sales. HT to WRSA for the heads up. It was a well known fact by all bikers, citizens and yes, WACO police (which includes FEDS) that the COC [Confederation of CLubs] meeting would be held on Sunday. All of the above groups, 1%’s, MC’s and Biker Orgs attend these meetings. Again the COC is a way to let others know about upcoming legislation, events & rides as well as discuss Patch issues. (Patches are the symbols that each group wears on their leathers, letting others know what group they represent). There are several “theories” floating around ~ Let’s get rid of the first one, it was NOT a fight over a parking space! Bikers rarely if ever fight over a freaking parking space! They don’t need to, they can fit 2-3 bikes per space! The second we hear is that it started in the bathroom, that could be the case as per other reports there was an issue that occurred. However, the weekend before the planned COC meeting there was an issue that may have spilled over to the fight that occurred. BUT the fight broke our PRIOR to meeting time. What we DO know is that the place was already surrounded by FEDS, WACO Police and ATF LONG before any biker showed up! WHY were they there? Literally HUNDREDS of biker meetings between the various 1%, MC’s and Org’s had met there in the past ….ALL peacefully! The PD states it was because of the dispute the previous week. HOWEVER, there was a fight that started inside Twin Peaks and made it’s way outside! Those fighting had KNIVES …NOT GUNS when they took the fight outside. WACO PD have not been very friendly towards bikers and the FEDS TOTALLY despise Bikers! Why? Because we are not afraid of them or their agenda! We are a threat to them! Remember folks we were able to organize in 24 days 800,000 -1.2 million bikers to DC! We did it WITHOUT their permission or support! They even SHUT DOWN the traffic cams…had the news NOT flown over the scene there would have been NO proof that we rode! Yes, folks, like it or not even 1%’s rode with us! They set aside their territories and rode peacefully! JUST like they do at ALL COC meetings! Bikers stand up to them, to their Christian hate, their muslim agenda and whatever else they want to throw at us! BIKERS ARE PRESENTLY THE BACKBONE of PATRIOT AMERICA! WHAT BETTER WAY TO BRING THEM DOWN THAN WITH BAD PRESS SUCH AS THIS! WHO’s bullets killed the 9 who died and those taken to the hospital? Where is all the video from that surrounds the TWIN PEAKS and all the other businesses? WHY have no charges been filed yet EACH of those in custody have a $1,000,000 bond? WHY were those who had LEGAL carry permits arrested? WHY are so many being held in jail that do not have records, were not part of the OMG’s they (PD) were targeting? WHY are ALL BIKES of those in jail being confiscated via Civil Forfeiture? Civil forfeiture is supposed to occur if someone is found GUILTY of a crime while that “property” was in use or used to commit the crime! WHY are bikers that had NO association with their targets being held on $1,000,000 bond? MANY are Christian Bikers and Veteran Bikers who committed no crime other than being on the scene? Now as a whole this group does NOT condone police bashing, FED bashing YES….but WACO PD seems to be part of the FED agenda! 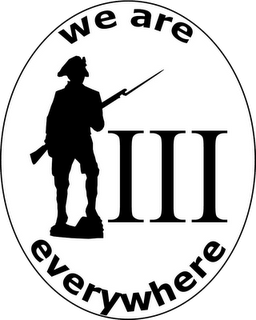 So America, ask yourselves this…WHEN SHTF (and it will) WHO do you want on YOUR side? BIKERS OR FEDS? We KNOW where the FEDS stand and we KNOW how much they hate bikers! LAST NOTE: There was NEVER EVER any threats made to WACO PD! That was TOTALLY made up! Related here and here from Free North Carolina. Capitalist Eric Spells It Out... BOHICA Any Questions? is with rope and lamp-poles. The Next Big Freak'n Emergency Will Affect Us All. No One Is Immune. Times are about to get hard. I believe that is imminent. There are no soft sides to what must be done. "The Storm" has been building and upon us for some time now. When it finally breaks, it will be of Biblical proportions. Seek out those who honor the good, the true, and the beautiful. Grapple them to your souls, as with hoops of iron. As a dear friend of our group has told us: "steadfastly and resolutely acknowledge Him, take the next right step, and be a sign of hope to those around you." Tyranny, oppression and suppression are evil and must be opposed. The first estimate of first quarter GDP was for .2 percent annual growth. That number will be revised into the negative territory after March's increase in the trade deficit, which subtracts from GDP, is incorporated into the next estimate. FOX News Poll: Voters Believe White House Incompetent, US Still In Recession And ISIS Has Moved Next Door. Last week, Sen. Elizabeth Warren, D-Mass., and New York Mayor Bill De Blasio published their Prescription for reviving the American Dream. 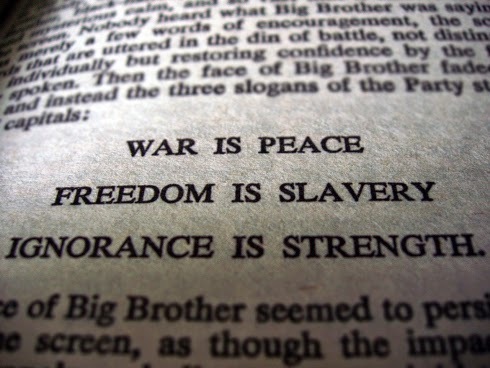 In an 872-word argument titled "How To Revive The American Dream", the words "FREE" or "Freedom" never appear. TrIhat's a clue. They open with a chilling refrain: Opportunity for success for most Americans is hopeless. 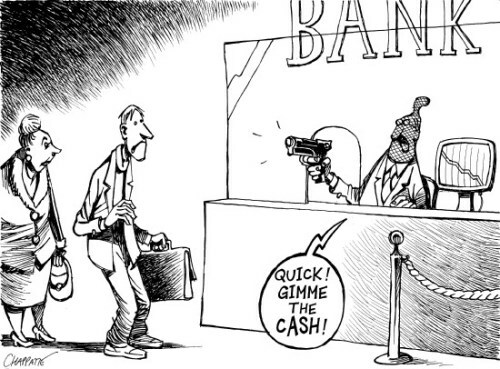 All but the rich are falling behind becuase the "GAME IS RIGGED". Their diagnosis: You can't improve your situation by your own talents or effort. Their prescription: Don't leave Freedom in the hands of the citizens. Only a massively larger central government, run by people like them, can help you. "...something like 1984 could very well happen; this is the direction the world is going in at the present time. In our world, there will be no emotions except fear, rage, triumph, and self-abasement... but always there will be the intoxication of power...if you want a picture of the future, imagine a boot stomping on a human face... forever." The police have destroyed their own credibility and it is through no one else's fault but their own that it has occurred. Decades of rampant and outrageous abuses, selective enforcement of laws against certain people, planting and falsifying evidence, lying both in court and out and more are all acts that are "unforced" and a matter of choice. 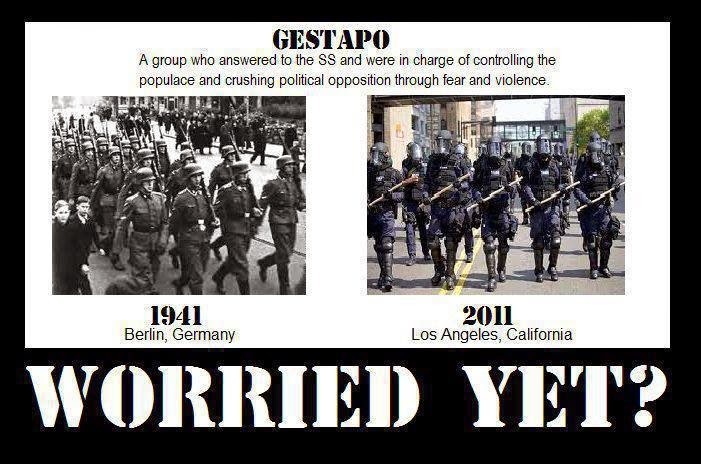 We've gone from officer friendly to Darth Vader and his storm troopers in a matter of 60 years. Same ideology too. 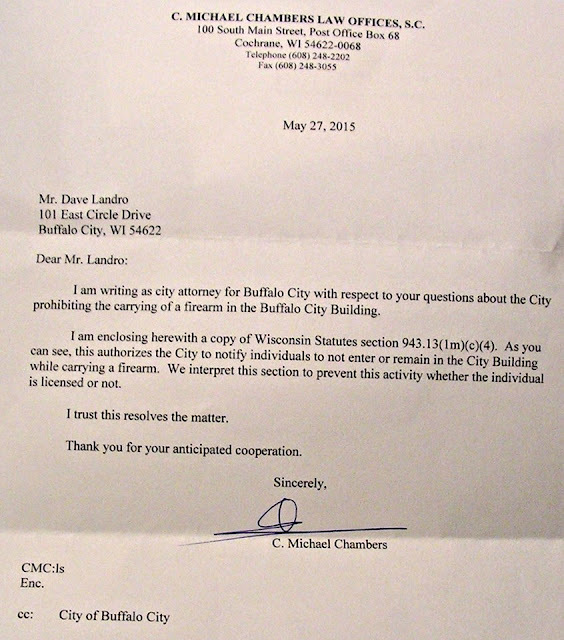 Anti-Gun Buffalo City Wisconsin Council President Refuses To Answer Questions About NO GUNS Sign. Last night, I attended a Buffalo City Wisconsin Council meeting and was met at the door with a NO GUNS sign. When my turn to speak arrived, I addressed some concerns I had with building permits. Folks were friendly, even jovial... when I finished, I asked about the NO GUNS sign. The mood and tone of the meeting immediately took on an austere, astringent cast... The temperature in the room seemed to drop appreciably. I was told, erroneously, that it was because it was a government building. In Wisconsin, government buildings are not required to be no gun. There are a few notable exceptions such as court houses, sheriff's or police stations etc. but this was not one of them. When I pressed to find out whether it had been decided by vote, and if so, who voted, one of the council members became angry, agitated and told me my time was up and I should leave. He said there would be no further discussion on the subject and that the city attorney would be contacting me by mail. I was not allowed to speak any further. I was also told by Lisa Schuh; Alderperson (Phone: 248-2528; Email: lisa.schuh@buffalocounty.com , that in Wisconsin, guns were not allowed in polling places. Either she was legitimately mistaken, simply didn't know, or lied. In Wisconsin, there is no law banning guns from polling places. I would recommend that Ms. Schuh discontinue rewriting Wisconsin law to fit her own reality. This is the same individual; Brock Seitz, who; while serving on the Tri-City Recycling Center Board, arbitrarily put NO GUN signs up at the Recycling Center. This having been done in a closed meeting of the Board (illegally) and mainly pushed by this fellow. A die-hard liberal. At one time, chaired the Buffalo County Democratic Election Committee. I enjoined the services of an attorney at that time, who was more than happy to write a letter of inquiry and a request to remove the sign. I also asked my fellow open and concealed carriers in Wisconsin to call and give their opinions. The letter and calls were more than enough to motivate them to take the sign down directly. Hopefully, the same will happen here. Please call and ask why the sign is in place and who voted to put it there. Keep comments polite and direct please.